AutoExpress reports this morning that Aston Martin is working on a ‘remarkable' new car to mark its 100th birthday next year. Called the Centenary model, plans are for it to be unveiled this summer. CEO Dr Ulrich Bez tells the British buff book: "This will be an entirely new model. We have to do something remarkable to mark our centenary. 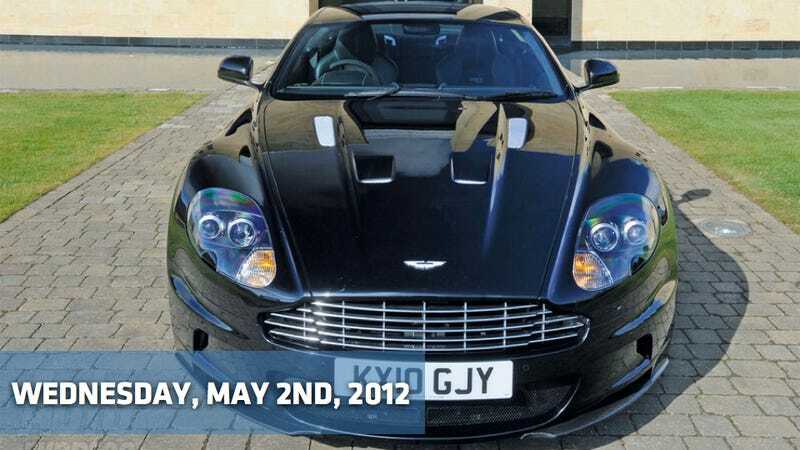 It won't be a DB9 with a Centenary Edition badge and it won't be a limited edition like the One-77 supercar. This will be a mainstream Aston." Expect the 6.0-liter V12 to deliver 550 HP to give the car a four-second time in the 0-to-62mph sprint. Nikkei reported Sunday that General Motors may take a 10% stake in Isuzu and now, according to Reuters, initially, GM actually proposed much more. Like, a controlling stake of more than one-third of Isuzu worth around $3 billion; but now all they're seeking is the smaller buy-in that would leave the automaker independent. Joe Isuzu would approve. Bloomberg reports that U.S. gasoline demand fell 0.4% last week and consumption stayed below the same levels levels for the 35th consecutive week, according to data from MasterCard. Drivers also bought 8.65 million barrels per day of gasoline in the week ending April 27, down from 8.69 million the week before. That was 5.6% below the year-earlier level. That helped drive the average pump price down 6 cents to $3.84 a gallon, down 1.3% from a year earlier. "While prices have dropped 10 cents in the past three weeks, which is positive for gasoline consumption, gasoline demand continues to post noticeable declines year over year," John Gamel, a gasoline analyst and director of economic analysis for MasterCard SpendingPulse, said in the report. South Korean automaker Kia began shipping its new luxury sedan, its most expensive car, to compete with Mercedes-Benz and BMW. Kia aims to sell 18,000 of the K9 sedan in the Korean market by the end of this year and 25,000 units globally in 2013, the Seoul-based carmaker said in an e-mailed statement today. The company plans to export the car to other Asian markets from the second half, and then expand to regions including North America and China, according to the statement. Yes, that's correct, we're getting the K9 here in 'murica. Insert your dog joke here. Mercedes-Benz regained the U.S. luxury-vehicle sales lead for the year over BMW with April deliveries rising 24%, the biggest gain of any premium/luxury brand. U.S. sales of Mercedes rose to 22,336 last month while BMW deliveries increased 12% to 21,062, according to statements yesterday by the companies. Toyota's Lexus, the top luxury seller for 11 years through 2010, slipped 0.1% to 17,551 despite overall gains by its parent company. Mercedes and BMW, which overtook Lexus last year to become the top-selling luxury brand in the U.S. after the tsunami devastated Japanese vehicle production, are competing for which brand gets to wear the big sales crown for 2012. BMW finished the first quarter with just a 36 vehicle lead over Mercedes, but big April results lifted Mercedes sales and gave it a 1,238 vehicle lead after four months over BMW. Lexus vehicles sold, however, rose just 2.6% to 66,647 during the same period. The all-new 2013 Dodge Dart will soon arrive at Dodge dealers across the country but the Dodge brand is already wrapping itself in its compact car. Literally. They've wrapped the automaker's born-in-Auburn Hills, MI headquarters with a giant wrap featuring the pointy-nosed little bar game car. The building wrap features the 2013 Dodge Dart with the American flag in the background and reflected on the hood of the vehicle. The building wrap features the line, "All that matters is what's ahead," which is taken from the company's Super Bowl spot, "It's Halftime in America." Their new office in Detroit, however, does not seem to be similarly wrapped. Maybe because all the people who know how to do it work up in the Detroit suburb of Auburn Hills.